Veteran of WWII - of Red Bay, peacefully at Grey Bruce Health Services Owen Sound on Wednesday, April 13, 2016. 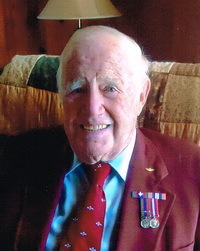 John Marshall Knowles at the age of 90 years. Beloved husband and best friend to Colleen (nee Ferris) for 57 years. Cherished father of Melanie Knowles (partner Derek Cunningham), of Keady, and Ron (wife Cindy), of Wiarton. Devoted grandpa to Kaitlyn Pfeiffer (partner Ross Thomas), Dan Pfeiffer, John Knowles, and Wyatt Knowles. Sadly missed by his brothers-in-law John Ferris (Shirley), and Wayne Ferris (Peggy), both of Maxwell; and his many nieces and nephews. Predeceased by his parents Daniel and Eva; twin brother Ronald (late wife Isobel); and sister Madeline (late husband Harry Rose). Jack was proud to serve his country during WWII with the 1st Canadian Parachute Battalion. He was a longstanding member of RCL Br. 202 Lion’s Head, and Cedar Lodge #396 Masonic Lodge, Wiarton. Family invite friends to gather with them for visitation at the Thomas C. Whitcroft Peninsula Chapel, 272 Berford St., Wiarton on Saturday, April 30, 2016 from 1- 1:45 pm. Members of RCL Br. 202 will provide a Memorial Service at 1:45 pm. A Celebration of Life service for Jack will follow the Legion service at 2 o’clock. Donations to Residential Hospice Grey-Bruce, Pike Bay United Church, or OSRH Foundation would be appreciated.